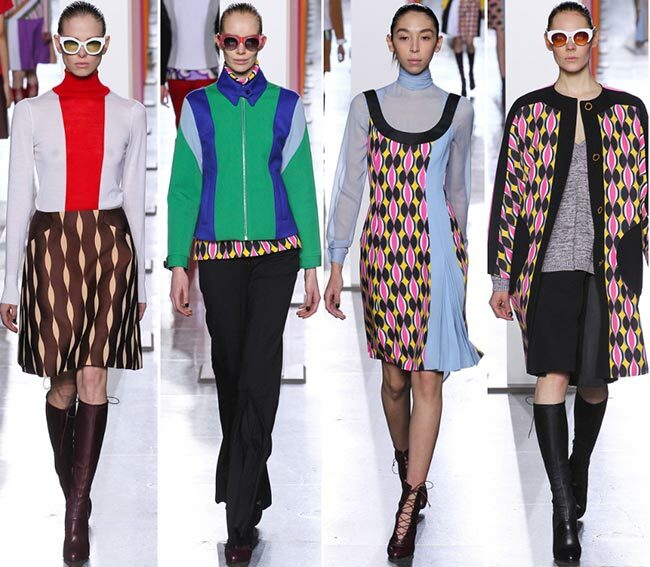 With Jessica Stam walking on the runway and a kaleidoscope of bright colors and psychedelic op-art prints unveiled, yesterday’s Jonathan Saunders fall/winter 2015-2016 collection show was a blast. 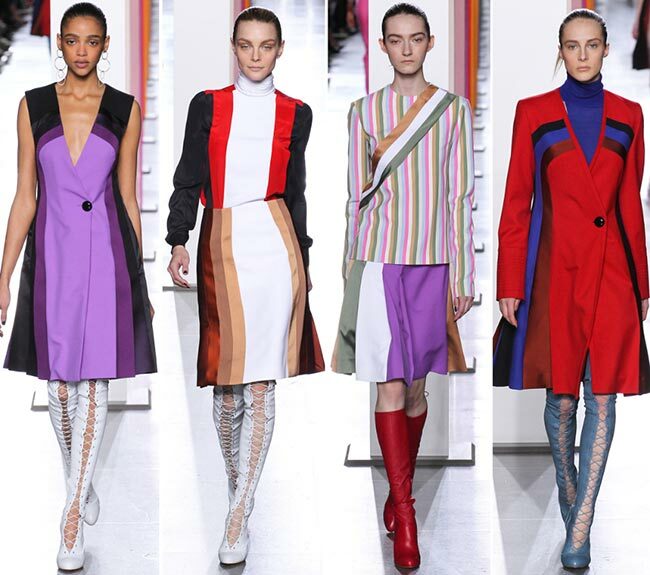 Saunders ditches the idea of “less is more’ and cheats the system going absolutely bold and colorful for fall, instead of bringing the traditional fall-appropriate gloomy palette. He explores artistic and graphic patterns in his gorgeous designs drenched in the swinging ’60s, a trend that is proudly making its way to fall simultaneously with the Seventies. He looked to Tate Britain’s Duveen galleries for inspiration to bring cheerfulness to the rainy days of fall with his gorgeous rainbow of colors and retro silhouettes with a contemporary edge. 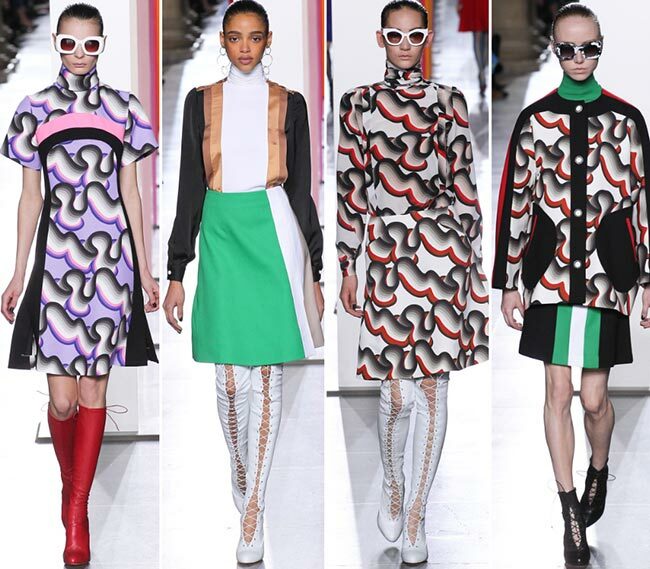 The entire Jonathan Saunders fall/winter 2015-2016 collection was art brought to life with every detail, cut and pattern appearing on the right spot to wow and take the simplistic shapes to a whole new level. 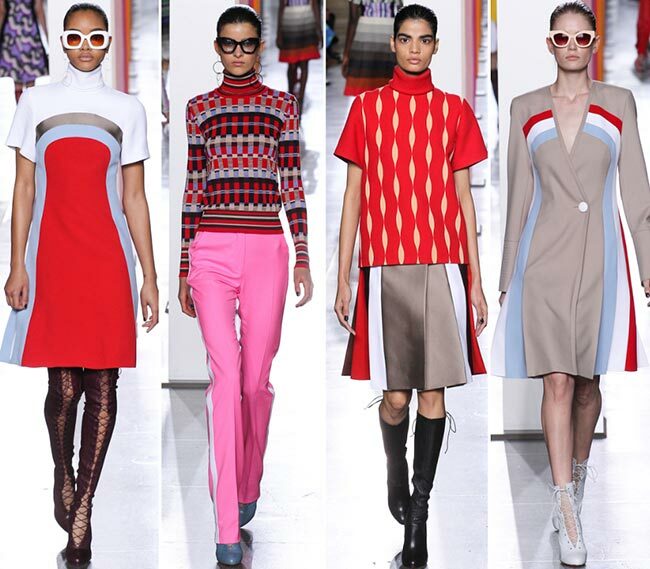 The designer put the focus on color blocking and small details to create statement-making looks, rather than experimenting with new cuts and textures, which has been a big tendency spotted throughout the runway shows in New York and London. He celebrates simplicity in a bold and eye-catching way, teaching us to dress boldly for the cold season as well, when the whole of the crowd gives preference to muted grays, blacks and navy blues. As far as the diverse color palette goes, we are treated to touches of whites, blacks, grays, creams and browns interrupted with big proportions of brights used, ranging from reds, vivid yellows and purples to lilacs, pinks, greens and blues. The graphic patterns and the stripes appear on each and every look showcased and you can hardly find a simplistic monochrome look in the entire collection. The whole of the lineup puts the accent on femininity spiced up with a mishmash of formalist meets fetishist vibes that makes the designs so mature, neat and sharp despite the cheerful palette utilized. You have amazing office-ready looks, which can easily go from day to night, being amazing attire options to be sported for cocktail parties as well. 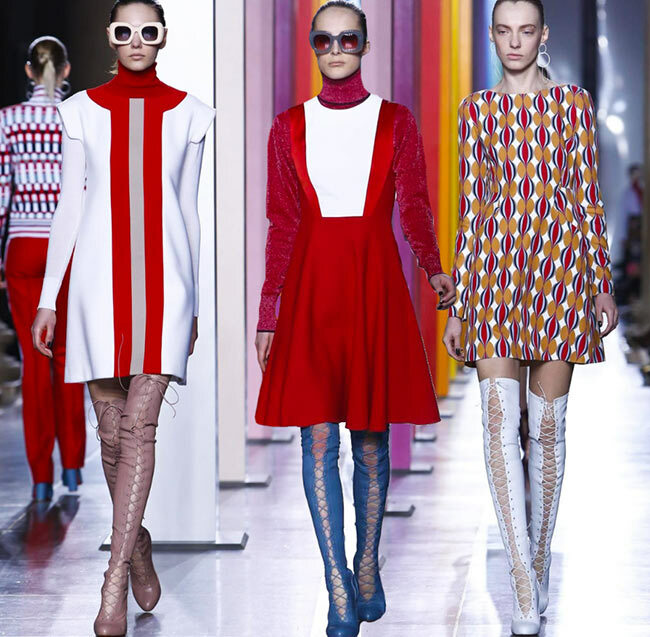 Dresses cut at knee-length, as well as flirty minis are the protagonists in the collection, however, we also discover Seventies-style tailored flare pants again coming in bright shades and being matched with printed turtlenecks. 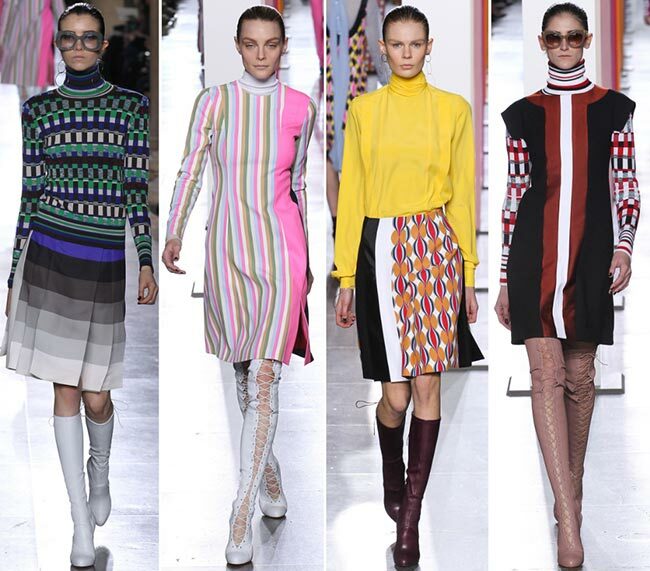 A-line color-blocked skirts are also big throughout the entire line, coming mixed and matched with short-sleeve turtlenecks, which are the next big trend spotted at the show. The latter also comes in delicate see-through fabrics, worn under beautiful frocks or with the knee-length straight skirts. Zip-up jackets and elegant coats top many looks presented, which are all perfectly accessorized with thigh-high or just below-the-knee lace-up leather boots to inject the iconic sixties Twiggy vibe to the outfits. Hoop earrings and oversized sunglasses with colorful frames are other accessorizing details used to enhance the posh of the collection. Beauty Jessica Stam closed the Jonathan Saunders fall/winter 2015-2016 collection show making an appearance in a color-blocked turtleneck matched with a vertically striped skirt and looking so elegant and feminine wearing her hair up in a sleek updo. It was a beautiful show to close the third day of London Fashion Week and to inspire endlessly for the cold days to come!